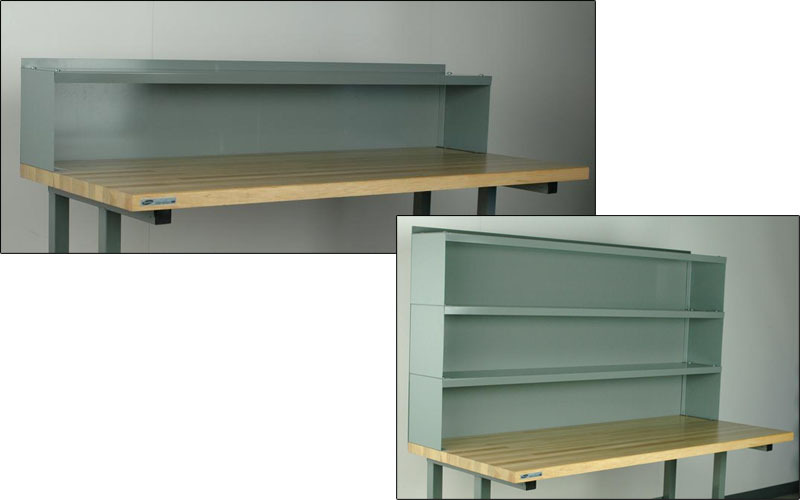 Available in 6", 12" or 18" heights, these raised shelves can be mounted to any workbench sorface. 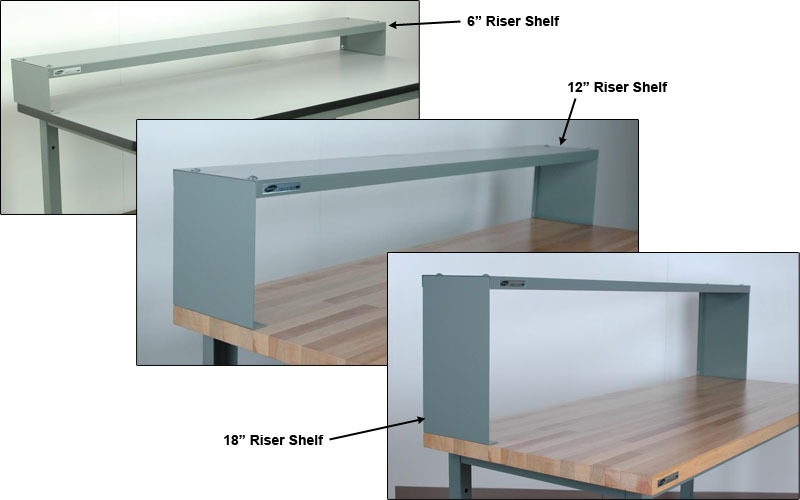 Most riser units attach to the top work surface, however on steel tops, they mount from the side. 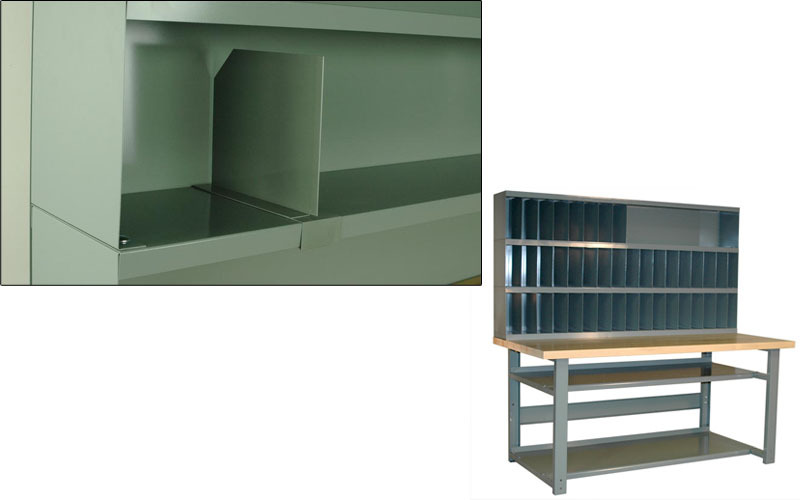 The 12" and 18" risers can be interstacked with the 6" riser to create several shelves of differing heights. 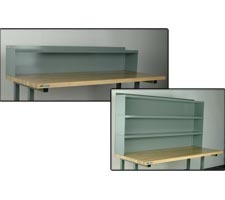 This divider simply hooks onto the front bend of any riser shelf and slides left to right to create any size storage slot. The dividers for a 12" or 18" high riser are 10" high and the dividers for a 6" riser are 4" high. A 3" wide base gives the divider a stable footprint when hooked in place. Divider is 16 Ga. and footplate is 18 Ga.
Rear Vanity Plates can also be added to these riser shelves. This panel bolts onto the back of the riser and also the work surface for additional support. Rear panels will work even if the application requires stacking the shelves. The optional outlets will bolt onto the top lip or anywhere on the panel below. Note: If ordered, rear vanity plates will be included for the riser size that you order. 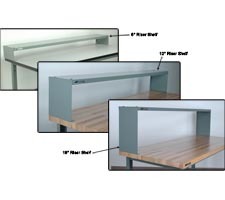 If ordering multiple benches and multiple riser sizes, please indicate in "Comments" field which size risers will have vanities and which (if any) will not. If we have any questions, we will contact you for approval. 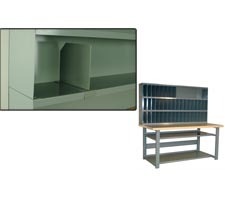 Keep items from rolling off your work surface with back and end plates.